I admit it. I drew a blank on what to write this month, and so asked several friends for inspiration. So, I now have an idea for the next two articles, but I am going to use hijaab, because even the akhawaat who brought up that subject said that it was a shame, but we need to address it because so many of our noble sisters don’t wear hijaab properly. This is not going to be about colors, or even niqaab or not. It is about hijaab. Let’s start with a definition. Not what it has come to mean, but what it meant in the time when the command was given by The Lawgiver, Allaah Subhana wa Ta’Alaa. The hijaab is the over garment that is let down from the top of the head and covers the Believing woman from literally head to toes. It is not the same as a khimar, which is the head scarf. It covers the breasts, it does not stop at them like the head scarf of the women of the Orthodox Jews; we’re supposed to be different from them, as we all remember from our readings of ahadeeth. It does not allow the hair to peep from underneath, nor for the ornaments, the jewelry, to be seen. It is worn when the Believing women go out of our homes, so that we are identifiable as Muslimahs, we are obvious in not being on display for men or others to find us attractive, it is to discourage those who lean towards zina’. It is not, emphatically so, an option. While not wearing it does not take one outside of Islam, there are penalties for being uncovered when outside of one’s home. Not lashes, not stoning, but something far more severe: Allaah’s displeasure. That which we do and do not repent from, we will have to answer for, in the grave and the ‘Akhira, the Hereafter. And do not forget, ya akhawaat, that our clothing is a part of our adornment. So, the nice dress, the blouse and skirt and khimar, the salwaar chemise, are all to be covered by a different garment, the hijaab, when we are out of doors, or in the presence of ghair maharim. Unless you work only with your abu, and brothers by blood and by marriage, and grandfathers, and uncles, and sons, that includes the men in the office, school, or hospital. A bit inconvenient, and there are some times when there are excuses, but since Allaah did not command us to go out and earn and provide for the household, but rather, He commanded the men to do so, that means that if we choose to, or have to (yes, I know, it happens) we have to make the effort to obey Allaah as much as possible, rather than take it as a license to obey our desires. Have you noticed? Allaah does not praise following our desires, even in marriage, but puts obedience to Him in all things as that which He is pleased with. We don’t want to go to extremes. That is not praiseworthy. But we have to do the best that we can, and ask Allaah’s help for the rest. So, to my sisters whom I meet on the street, with throats exposed, blouses tucked into the long skirts, jewelry flashing … my dears, you look lovely, really. But you are not following the Sunnah, and that is what we are here for, because the Sunnah is as much to be followed as the Qur’an. The Prophet (sallallaahu 'alayhi wa sallam) said: "Allaah, Most High is Ha'yeii (Bashful), Sit'teer (Shielder). He loves Haya' (Bashfulness) and Sitr (Shielding; Covering)." The Prophet (sallallaahu 'alayhi wa sallam) also said: "Any woman who takes off her clothes in other than her husband's house (to show off for unlawful purposes), has broken Allaah's shield upon her”.. " This hadith is proof that, depending upon the kind of action committed, there will be either reward (if good), or punishment (if bad). Insha'alLah, I'd like clarification on "that which is apparent." I couldn't help notice the advertisement on this website to the right after I finished reading this article. It's a contradiction to talk about Hijab on a site that promotes it when this same site accepts to display ads of women not wearing Hijab. I am not against those who don't wear it but this reminds me of a local mosque here who lectures about Haram earned money but yet accepts haram money by justifying it they will use it for things like toilet paper etc...instead of discouraging youth to work in a unlawful environment by not accepting their money. Maybe the analogy is a bit stretched but my point is that there has to be consistency. 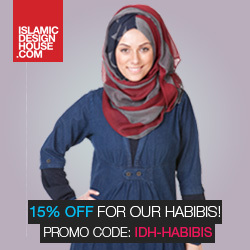 If this site promotes the wearing of Hijab then it should not endorse ads depicting women not wearing it. I really appreciated the way you stated everything in this article, mashallah. May Allah reward you. Instead of sounding overbearing, you said it with concern and kindness. I was considering compromising my niqab for a job recently, but since I read your post, it really gave me strength. Jazak Allah khair! The Qur'an says nothing about not allowing women to be beautiful. It simply asks us to be modest and hide parts of us that the world shouldn't be allowed to see for they are unworthy of the beauty of each woman. That does not mean that women can't make themselves feel beautiful.... sometimes feeling spiritually beautiful translates into being physically beautiful. I think you are misguided and are not qualified to say that there is one way to wear hijab because you are not Allah. Allah told the prophet to tell the women of that time (who traditionally wore veils styled like the veils you see on christian women during marriage) to take that veil and cover their bosom. He prescribes us to cover our bosom and to not reveal our curves... I don't recall Allah saying that you must cover every inch of hair or to make sure you are not attractive. Part of the reason we wear it is so men look at you as a human and not as a piece of meat to be blunt. But that is just one aspect of hijab. The intention is not to make ourselves different from jews, that is the most humanistic view on hijab. It is so we retain piety. Any woman can wear hijab like Muslimahs for the sake of piety. men to lower their gaze and be modest. That is purer for them. Lo! perspective of women's role in society. I find it disappointing that whenever anyone brings up verse 24:31 sisters are so quick to point out the previous verse, the verse pertaining to men. Yes the Quran should be read in context, HOWEVER, why do we have the 'let them do it first attitude'. The Sahabiyat and the sahaba used to RACE to obey the command of Allah as SOON as it was revealed with little to no comparison with anyone else. This attitude actually reminds me of my little brother, whenever my mom asks him to clean up the living room, he says why aren't they doing it, tell them to do it (referring to his older siblings). Just some constructive feedback - we can't write an article on hijab, and then try to define it using a word that is not in the Qur'an. I found the definition confusing when you said the hijab is not the khimar - but rather the outer garment. Because most people refer to the hijab as a headcover - it makes more sense to say that the hijab is the modern day slang word FOR khimar - which is a cloth which rests on the head, and comes down. We should use the word from the Qur'an to describe the loose covering garment - which is a plural form of the word "jilbab" - and then not the "modern" sense of the word jilbab, but the literal meaning and objective of this word. Also - there is a lack of reference to prove that one MUST wear a garment that starts from the head and heads down to the toes - I've not heard any scholar say such with the exception of a tiny few in places like Iran - so to say that anything less isn't following the Sunnah makes the majority of the Muslim world sinning - even those in abayas and jilbabs. Yikes! Next time, instead of writing for the sake of writing, it may be better to collect more research, and also appreciate the steps sisters are taking to cover. Like many of the people who have commented, I am confused as to how you translated the ayat to mean that women must wear a abaya/chador (a garment that covers from head to toe). If you would truly like to prove your point, you will need exact proof for what you are saying. You defined the ayat in one way, and we can certainly define them in another - if we are all going to define it based on how we see it, and not quran/hadeeth proof. Please write a follow-up article to prove your points. Jazaki Allahu Khairan.